Members of the British public are getting their first extended trial of a driverless shuttle bus. 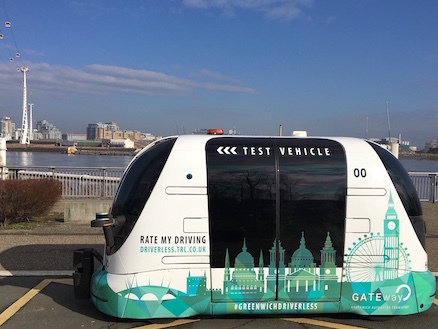 Over the next three weeks, about 100 people will travel in a prototype shuttle on a route in Greenwich, London. however, there will be a trained person on board who can stop the shuttle if required. Oxbotica, the firm that developed the shuttle, said 5,000 members of the public had applied to take part in the study. "Very few people have experienced an autonomous vehicle, so this about letting people see one in person," chief executive Graeme Smith told the BBC. "We hope to gain acceptance from members of the public for vehicles sharing this kind of space with them. "We are also looking at how people in the vehicle respond when being transported from A to B." The shuttle seats four people and has no steering wheel or brake pedal. During the trial, five cameras and three lasers will help it navigate a two-mile riverside path near London's O2 Arena, an area also used by pedestrians and cyclists. It can see up to 100m (328ft) ahead and comes to a steady stop if it detects something in its path - although it can also do an emergency brake if required. "It's been designed to be safe and fail-safe specifically in a pedestrianised environment," Dr Smith said. Officials behind the Gateway Project believe the shuttles could improve transport links in Greenwich. They say paying passengers could begin using the system by 2019 on a trial basis and that it could eventually be rolled out elsewhere. Industry Minister Nick Hurd said: "The UK has a history of innovation in the auto sector and this type of technology has the potential to save lives as well as offer freedom to the elderly or those with mobility impairments." 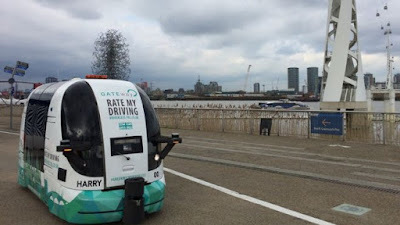 It is not the first time that people have been invited to travel in tests of autonomous road vehicles in Britain. At a recent trial in Milton Keynes, Oxbotica allowed journalists to try its driverless cars and a traffic warden was granted a wish to come along for a ride. Members of the public have also tested driverless road vehicles elsewhere in the world. In January, Las Vegas trialled an autonomous bus that ferried passengers up and down Fremont Street in the city's historic zone amid traffic. And in August 2016, Singaporean firm nuTonomy claimed to have become the first company to offer driverless rides to the public via its taxi app. Its rides are only offered via a small number of cars in a 2.5-sq-mile area of the city state, and pick-ups and drop-offs are limited to specific locations.